The Ultimate Monster Drum Lick? 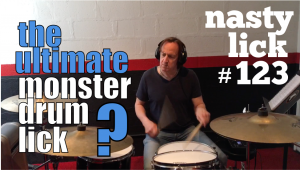 I know that “The Ultimate Monster Drum Lick” is a pretty provocative title. And I’m actually not particularly prone to hyperbole. But this idea, even at the stage I am at with it–which is admittedly early on my journey to master it–has so much power and holds so much promise for incredible speed and power, that I don’t think I’m over-selling it. The germ of the idea is really just a single stroke roll between all four limbs, using double bass drums. Like so: Right Hand, Left Foot, Left Hand, Right Foot. The concept is very exciting to me. Just imagine how fast it might be possible to play this! In this version of it (“Nasty Lick #123”), it’s played as 16th note triplets. Check out this video of me messing around with this in the practice room. As I mentioned, I don’t think I’m that good at it yet, but even at this early stage–I’m only playing at around 100 bpm–it sounds pretty massive! Let me give you a quick overview of the PDF. Example #1 is just the germ of the idea, written out. It’s the basic pattern, written out as 16th note triplets just between snare and two bass drums. Example #2 is the pattern I play at the beginning of the video. It’s simply orchestrating #1 around the toms and connecting it with a paradiddle-diddle on the snare. Example #3 is last version I play, which is essentially #2 only all on the the snare drum. The coordination required to play this is pretty tricky, so take your time and start slow. Persistence will pay off!